Surprisingly or not, an iPhone 5 unit has been finally leaked in the wild. We do not know if this is actually how will the sixth-generation Apple smartphone turn out to be, but according to the source, a model has been smuggled out of a producing factory and captured by the camera. 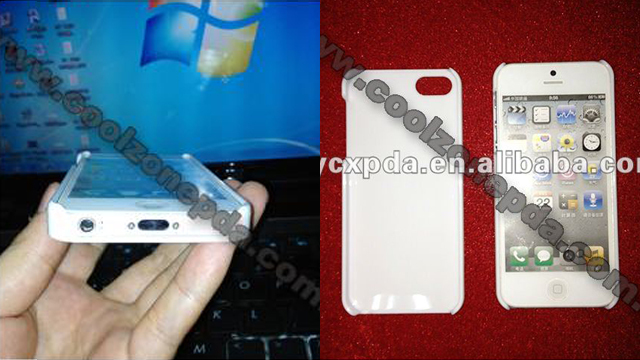 The pictures clearly show a white version of the iPhone 5 on top of a case with protecting margin on the sides. The source of these rumors is a Chines case manufacturer that has showed the smartphone on its product pages. From the images we can clearly spot the 19-pin dock connector that has been discussed in the past period, a standard 3.5mm jack for headphones and everything else that a smuggled phone from a Foxconn factory would possess. The leaked iPhone 5 also appears to be a bit larger than its predecessor and probably, a bit thinner, although that’s clearly not visible to the naked eye. Regarding the authenticity of these pictures, it’s hard to say if the iPhone 5 has truly been leaked in the wild. The model matches every hint we know so far, including the form factors, the new-age port and even resembles the white bezel we’ve captured a week ago. Now, if we were to take in consideration the expected iPhone 5 release date, which is September 21st, these leaks may come just in time. The iPhone 4S was also smuggled with one month and a half in advance and presumably found in a bar, but a couple of pictures will not make believers out of us. Moreover, due to the fact that various renders have appeared in recent times and this could as well be their materialization, please take the information with the custom grain of salt.